Aperol is the perfect aperitif! Bright orange in color, with a unique bittersweet taste, Aperol is the product of 7 years of hard work and experimentation by Luigi and Silvio Barbieri. It is an infusion of oranges, herbs, and roots in a perfectly balanced combination that delights the senses. For almost 100 years, Aperol has grown in popularity all over the world. It is one of the most widely consumed cocktails in Italy. Light, sparkling, and refreshing, an Aperol Spritz is the quintessential social signature drink. It can be enjoyed before a meal as a true Italian aperitif, or as a lighter option at an after-work get-together. Symphony Loo is passionate about the hospitality industry. 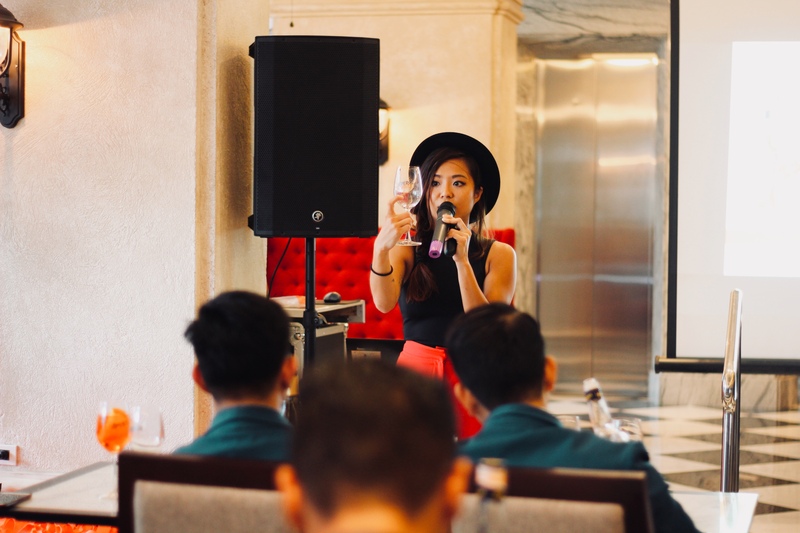 From an early age, Loo showed a keen desire to follow this path and began her bartending career at the One-Ninety Bar by Javier de las Mulas at the Four Seasons Hotel Singapore. In 2015, she became the beverage manager for The Dandy Group and would oversee establishments such as Neon Pigeon, Fat Prince, The Ottomani, and Summerlong. Two years later, she was awarded the “Rising Star of the Year” by the Bar Award of Singapore. Following her departure from The Dandy Group, Symphony Loo was named as the Campari Group’s new regional brand ambassador for Southeast Asia. Held at the 1898 Hotel Colonia en Las Filipinas in Poblacion, Makati City, the event was hosted by writer and vlogger, Acushla Obusan. The Masterclass was attended by a number of personalities and bartenders from prominent and partner establishments in the metro. At the masterclass, Symphony Loo discussed the history of Aperol and as a treat, taught guests how to concoct the perfect Aperol Spritz! The name says it all: Aperol is the perfect aperitif. Its unique bittersweet taste and bright orange color derive from a secret and original recipe, that has remained unchanged over time as a result of a hard work of 7 years of experimentation. An infusion of selected primary components including oranges, herbs and roots in a perfectly balanced combination. Aperol is available in select establishments across Metro Manila.